Today was a very special day. I began the process of autographing and shipping “Faith, the Ugly Dog” books. I took some time to get all of my tools together–black felt pen for signing, black ink stamp pad and dog paw print stamp, USPS boxes, packing tape–before I began the process. I like to be organized. I felt that it was only fitting that the first book I autographed was for my best and dearest friend, Kathy Carr. 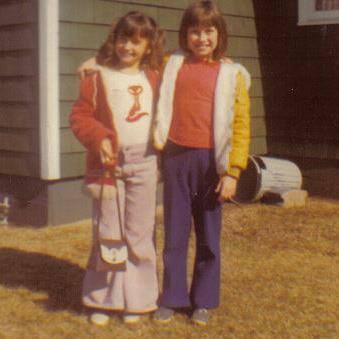 Kathy has been my friend for 43 years. We met in the third grade at H. V. Bear Elementary School in Miamisburg, Ohio and became fast friends. First play date with my best friend Kathy. We were inseparable for many years, then as many friends so, drifted apart somewhat throughout our separate life journeys. When we reconnected 13 years ago, it was as if time had never passed. The wonderful thing about our friendship now is that we are so much more wise and are able to appreciate the blessing of our friendship. No matter what anyone tells you, there are some good things about becoming older. 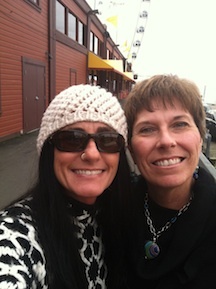 Me and Kathy in Seattle in 2012. 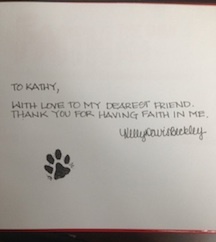 I hope you enjoy the book my dear friend Kathy. Thank you for your friendship, love, support and faith in me. « Previous Post: Faith the Ugly Dog books arrived today!